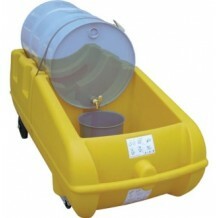 An exceptionaly well designed Drum Cart which offers mobile dispensing whilst catching drips and acting as a security bund. Perfectly balanced allowing easy operator use. Fitted with heavy duty rear rubber wheels and rotating castors with swivel brake for extra manoeuvrability.